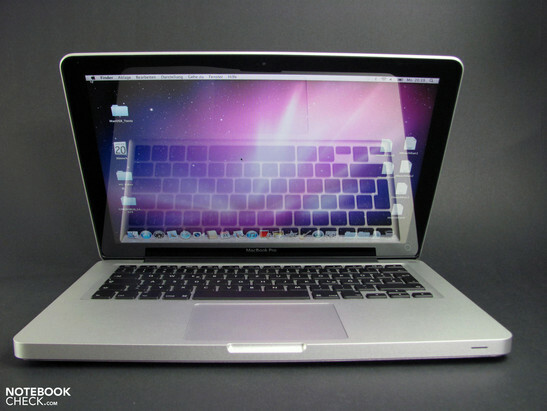 Apple fans have anxiously been awaiting the current revision of the small MacBook Pro, having to make due with the antiquated Core 2 Duo series processors until now. 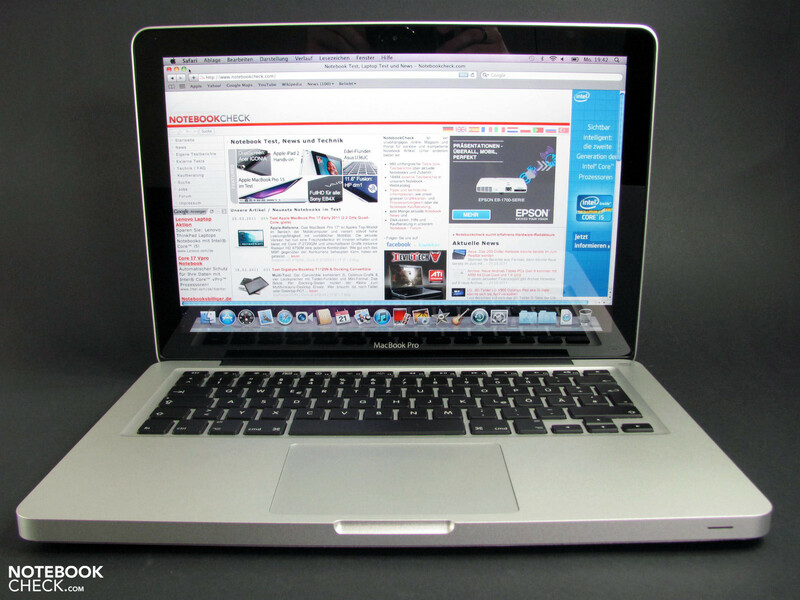 Choosing to replace the graphics card instead, Apple chose to house the Nvidia GeForce 320M in the MBP 13 in mid 2010 rather than switching to Core i5 processors (since the included Intel HD on-board graphics card didn't jive with Apple's preferences)—our review of that model was aptly tagged graphics update. Now, Apple has finally made the leap to a new set of processors, since on the one hand the Intel HD Graphics 3000 comes much closer to satisfying Apple's high standards and—on the other hand—it would truly be astounding if Apple still stayed with an older generation of processors. 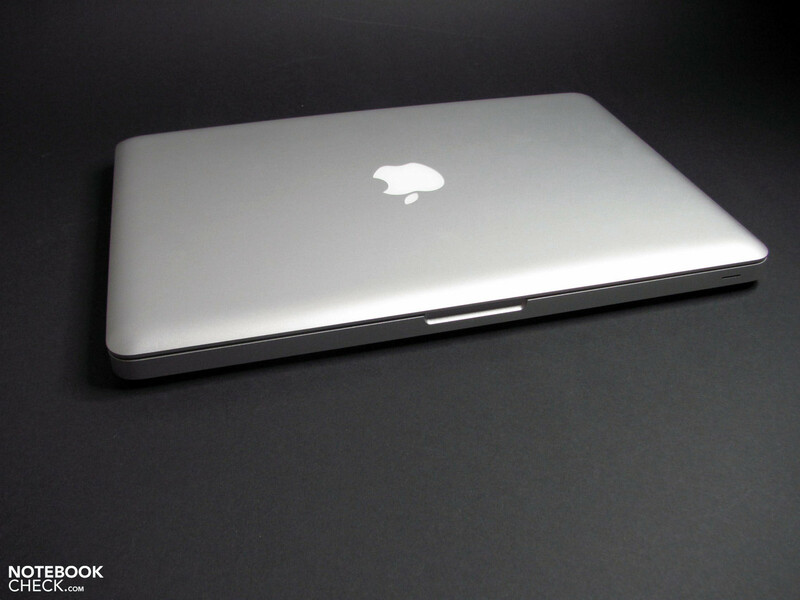 The basic configuration of the MBP 13 reviewed here is equipped with an Intel Core i5-2415 CPU, Intel HD Graphics 3000, 4 GB RAM, 320 GB hard drive and the brand new Thunderbolt port. In the Apple Store, its priced starting at 1150 Euro, but other retailers are offering it starting at under 1100 Euro. 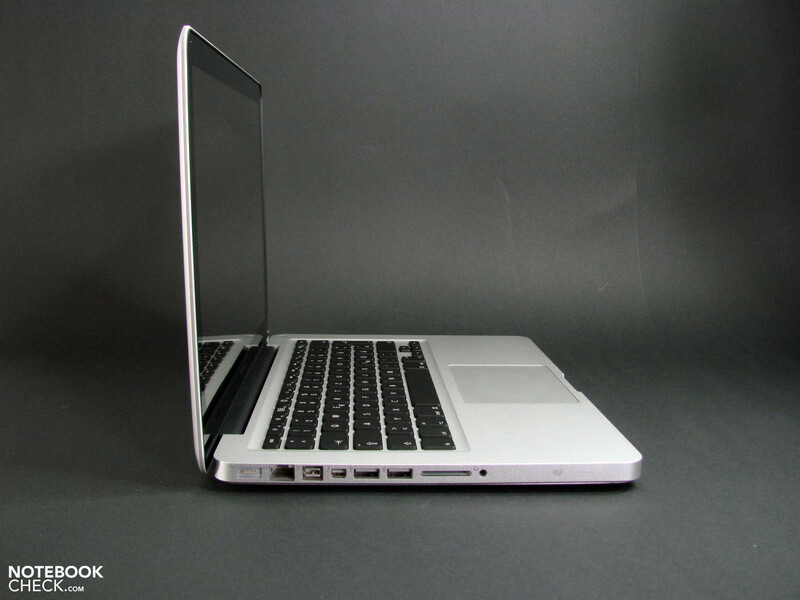 Not a single complaint do we have about the case in the MacBook Pro 13 at hand. Poor craftsmanship, unequal spacing or faulty materials won't be found here. 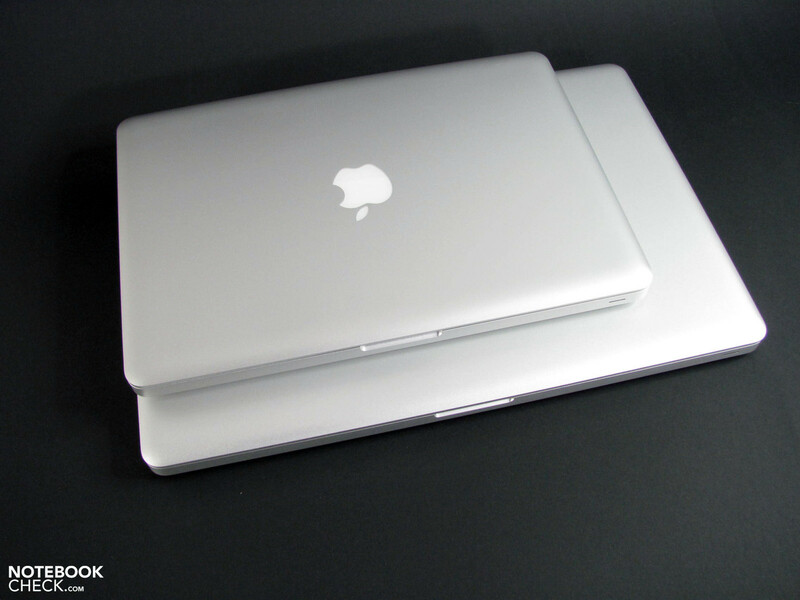 The case is wonderfully sturdy and the display hinges are a shining example for other manufacturers. 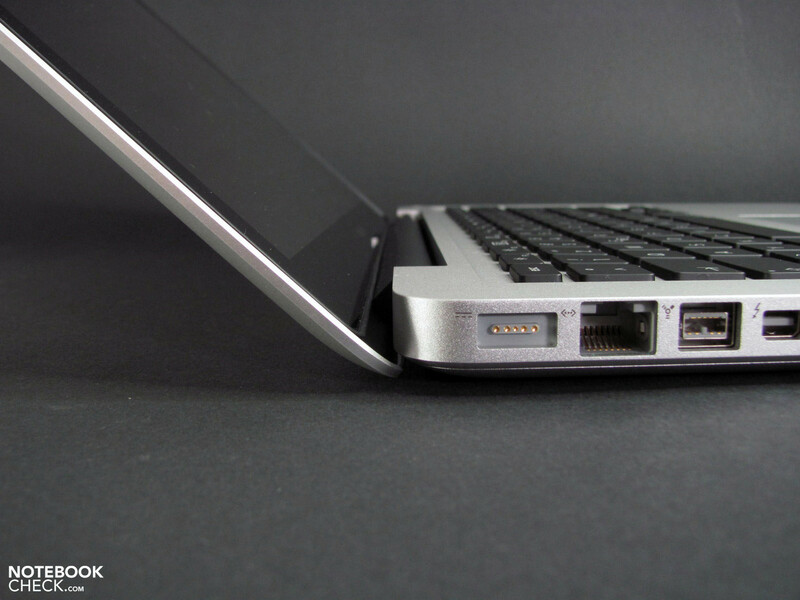 As is true with other models, the case corners are bit sharp here, but this really doesn't present much of a problem. 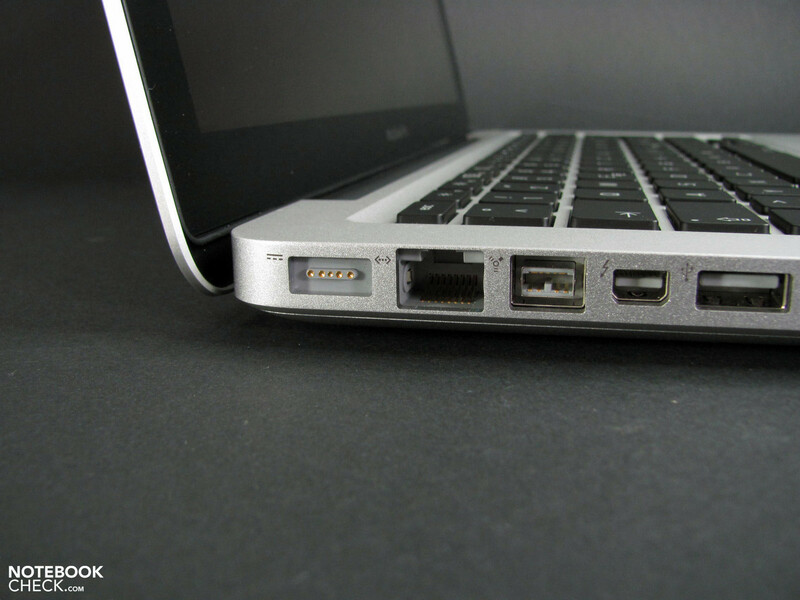 The variety and placement of ports is the same as for the MBP 13 with a 2.7 GHz CPU. In addition to the details found here, it's worth noting that memory cards can't fully be pushed into the card reader, rather they stick out about 1 cm. We also checked the transfer rates of the ports. Here, the performance in Mac OS X is considerably better in some areas than in Windows 7. 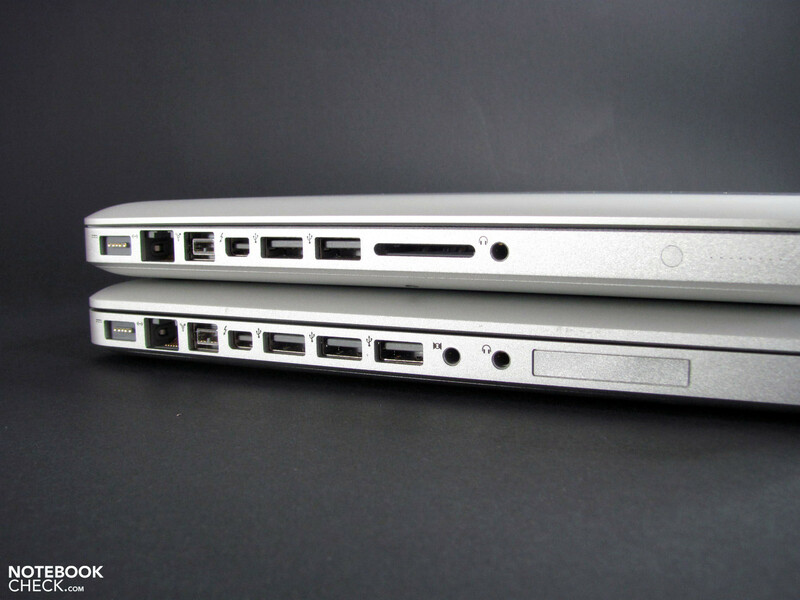 This difference is espeicially pronounced with Firewire 800, which sends and receives data at 80 MB/s in Mac OS X compared to 60 MB/s in Windows 7. The chart below shows a side-by-side comparison of all transfer rates (this also applies to the faster version of the MBP 13). 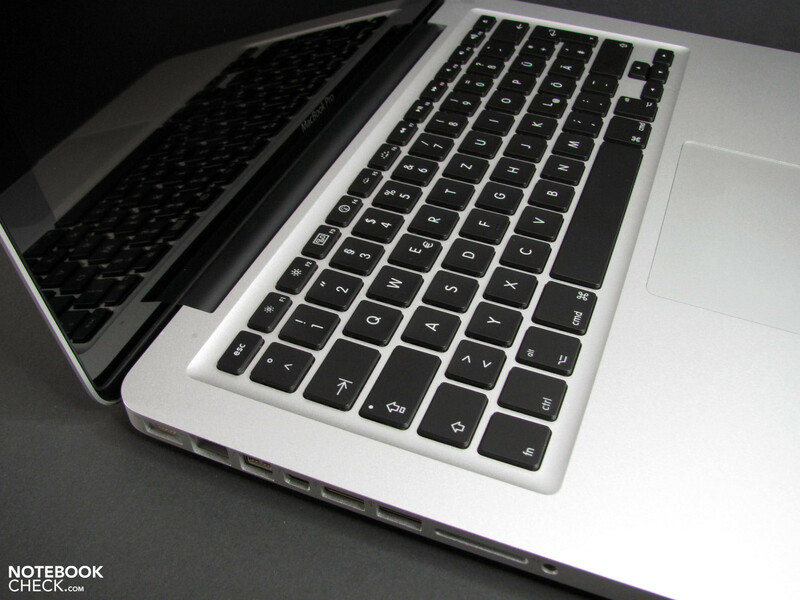 The keyboard and touchpad remain the same as in the other new MacBook Pro models we've reviewed. 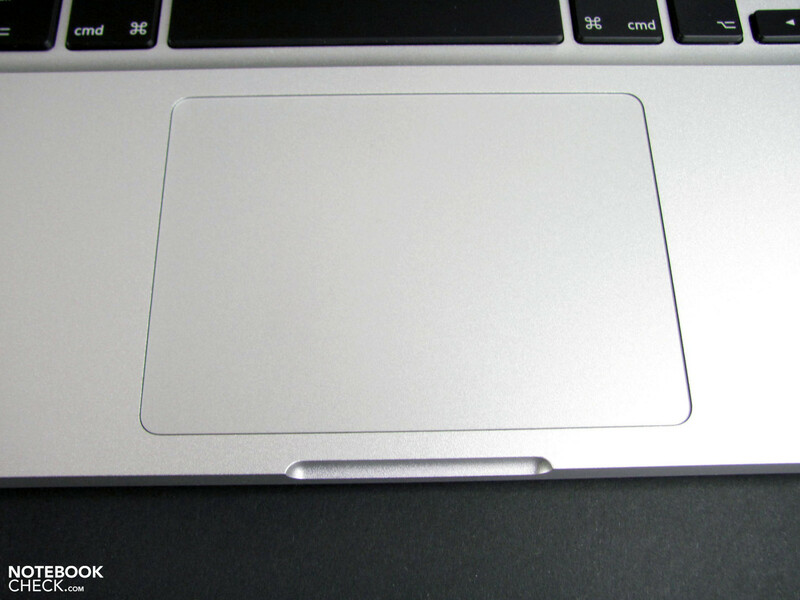 As usual, both the keyboard and trackpad are of very good quality. 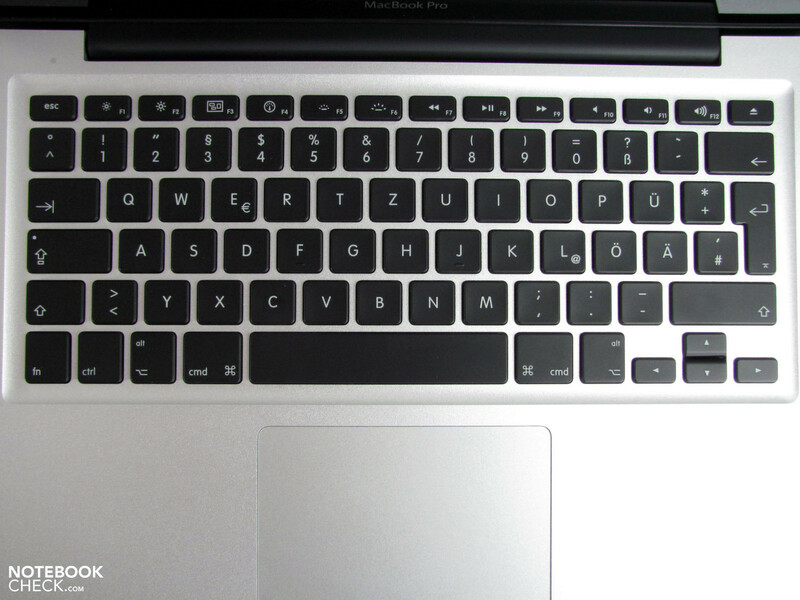 Only Windows users will have to take some time to get used to the slightly different layout, the most important differences of which are the keyboard shortcuts—most "ctrl" shortcuts in Windows use the "⌘http://en.wikipedia.org/wiki/Saint_John%27s_Arms" key in Mac OS X. 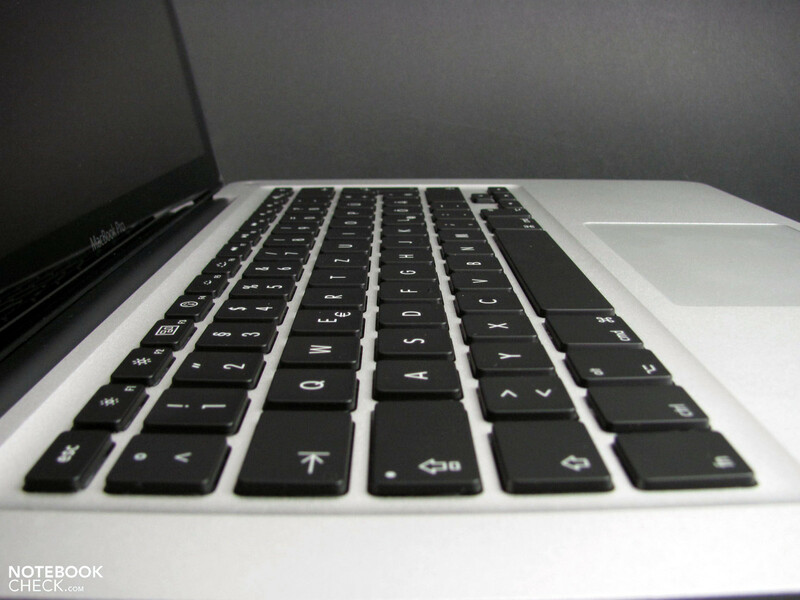 An in-depth appraisal of the keyboard and touchpad can be found here: MBP 13 (2.7 GHz). 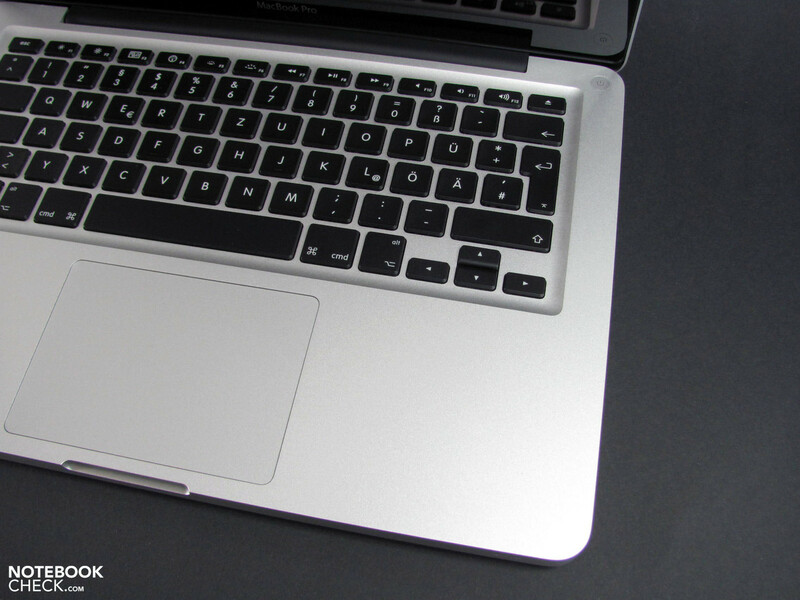 The glossy display in place in the test model at hand is the same one as in other, more powerful models of the MBP 13 we've reviewed. The broad strokes are outlined in the images below, for the nitty gritty check out the in-depth review. 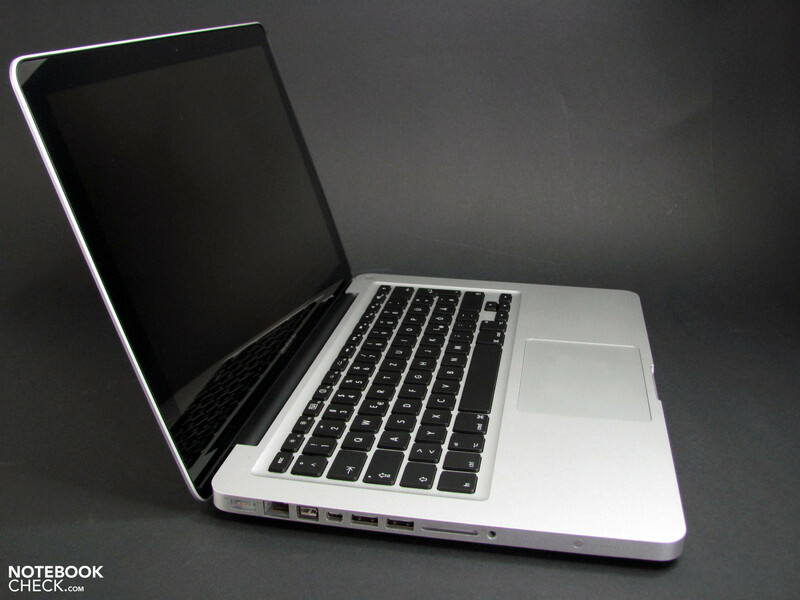 Like all the models of the new generation MacBook Pro's, The 13" model also comes with a current Intel Sandy Bridge chipset. 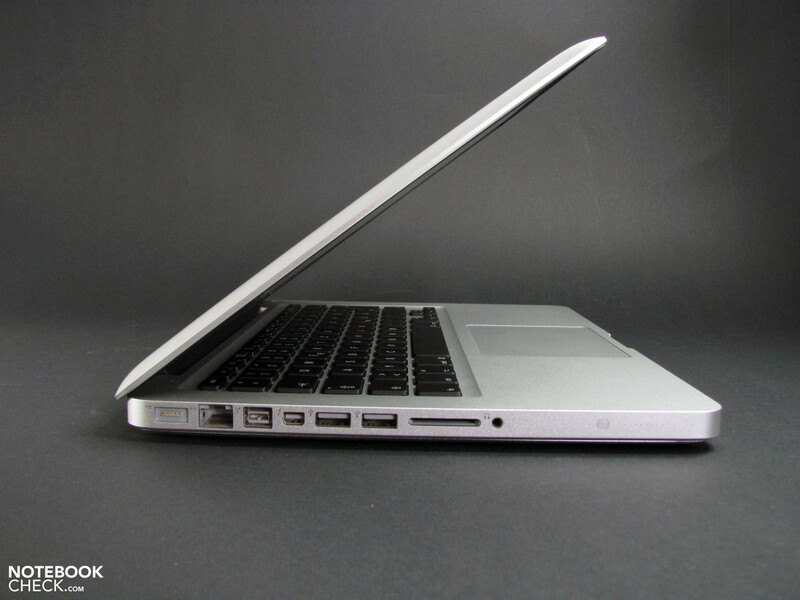 For the CPU, we have here the Intel Core i5-2415, which is essentially identical to the Core i5-2410 but has a smaller casing, making it easier to fit into compact notebooks. Among the features included is Hyper-Threading (a maximum of 4 threads can be simultaneously processed), Turbo Boost 2.0 (overclocking each CPU core to a maximum of 2.9 GHz) and the on-board graphics card: Intel HD Graphics 3000. 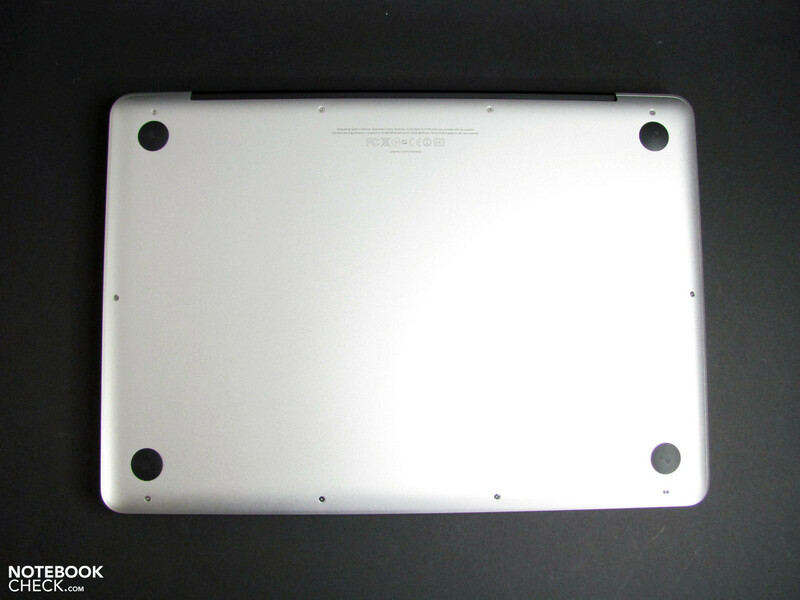 Within the CPU casing you'll also find the memory controller, which can address up to 8 GB DDR3-1333 RAM. The particular model we're reviewing here comes with 4 GB DDR3 RAM, spread across two slots, each equipped with a 2 GB chip—but these can be replaced with 4 GB chips to reach the full potential. 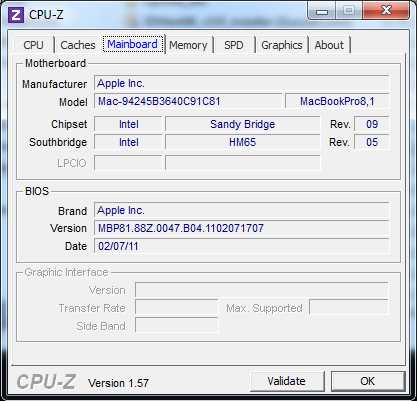 The level of CPU performance has clearly risen compared to the 2010 MBP 13 with a Core 2 Duo processor. 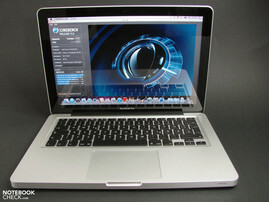 This fact is demonstrated by benchmarks we performed in Mac OS X as well as those in Windows 7. The SuperPi 32m computation only took 735 seconds compared to 1160 seconds with the older Core 2 Duo P8600 CPUs. wPrime 1024 runs at a faster 632s, compared to the old score of 1100s. The Cinebench R11.5 CPU score in Mac OS X jumped from 1.36 points to 2.59 points, and in Xbench 1.3 the CPU sub-score rose from 169 to 231 points. This translates to a leap in performance of 36% - 72% depending on the particular benchmark. 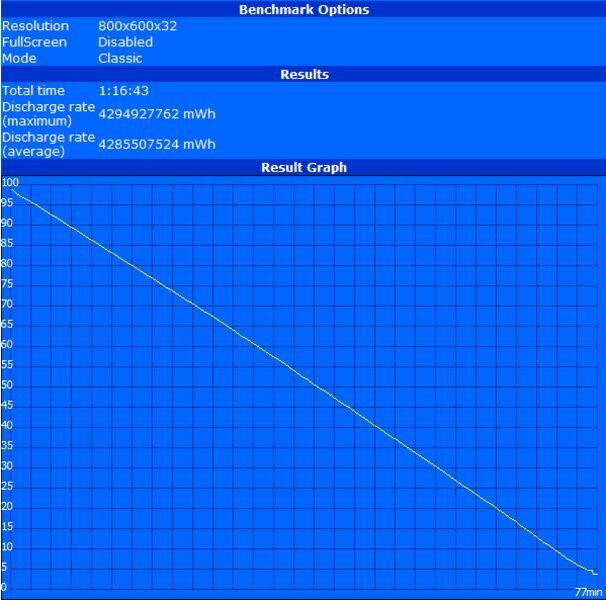 The Turbo Boost worked fine in the CineBench R10 Single-Core test, shooting up to 2.7 GHz and up to 2.9 GHz in the SuperPi computation benchmark for a short while. 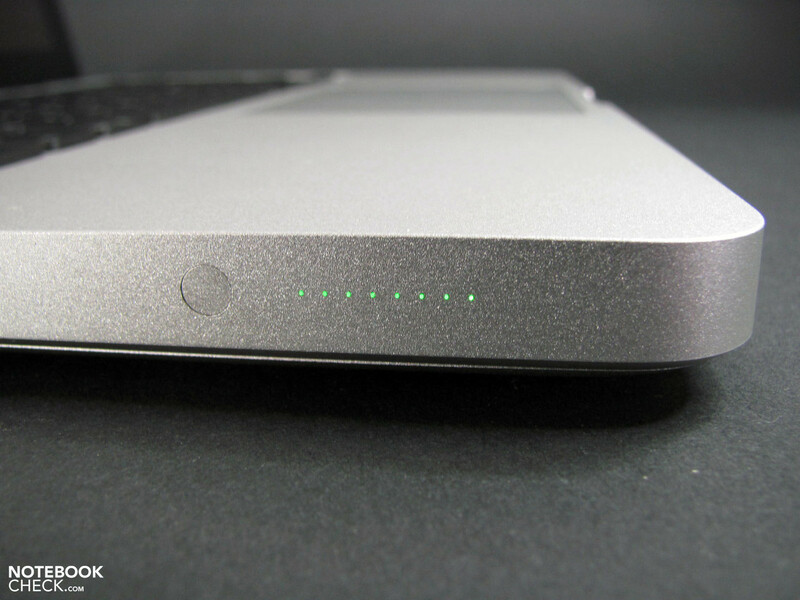 With the DPC Latency Checker we saw a very similar picture to that of the MBP 17. 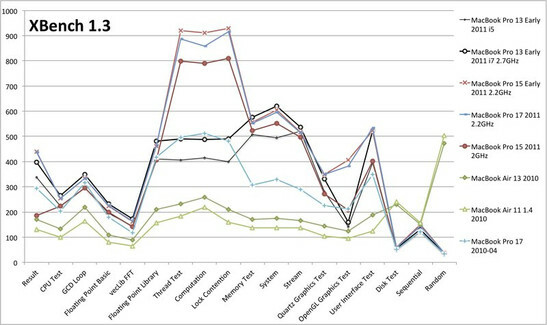 Only isolated cases of the latencies "in the yellow" were observed, which could lead to small errors in synchronization with peripheral devices. The level of graphics card performance isn't quite as exciting. 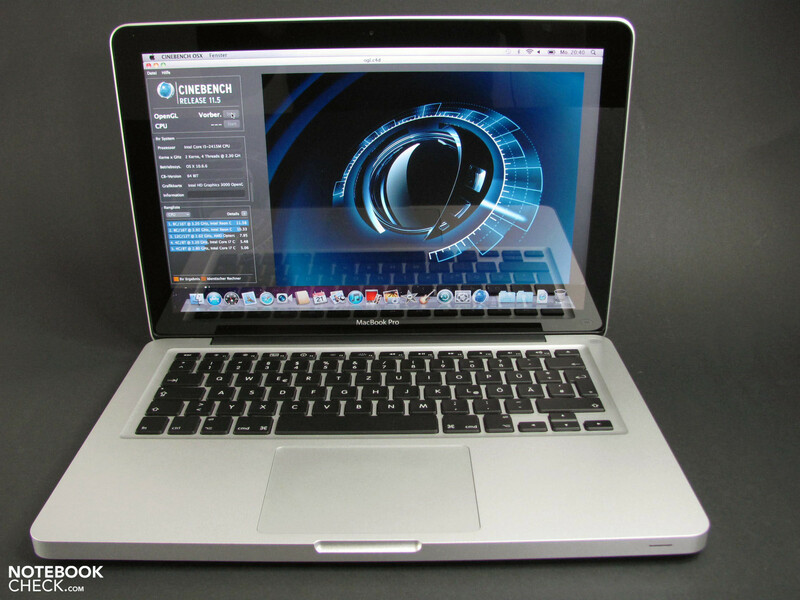 The Nvidia GeForce 320M from last year's MBP 13 managed 12.61 Bps in the Cinebench R11.5 OpenGL test. 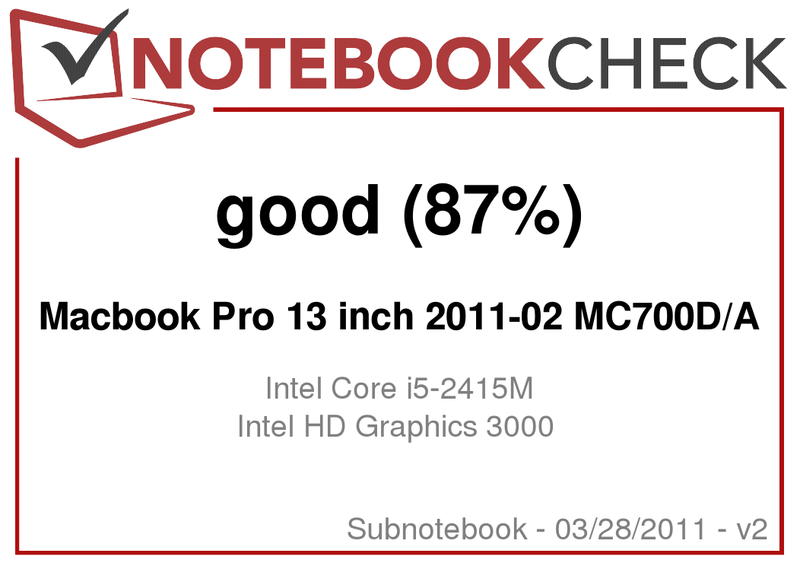 The Intel HD Graphics 3000 in the new MBP 13 isn't quite up to muster, working at a slower 10.94 Bps. The difference becomes still more pronounced in the 3D Mark '06 Benchmark, where the new on-board GPU is behind at a mere 2550 points, compared to the 4707 points of the GeForce at a resolution of 1280x800 pixels. This translates to a decrease in performance of 13 – 46% depending on the benchmark at hand. To sum things up, buying the new MacBook Pro 13 means better CPU performance at the expense of graphics rendering power. The previously built-in Nvidia Geforce 320M was definitely more powerful. 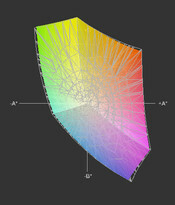 How the reduced 3D-rendering performance actually affects overall quality of use really depends on your individual needs. The Geforce 320M was hardly fit for resource-demanding 3D tasks like animation. And on the other hand, the Intel GPU can easily manage playing back full-HD videos smoothly. When running Furmark, Cinebench R10 OpenGL and SuperPi simultaneously, we observed a significant throttling of the CPU, the clock rate dropping considerably. After several minutes of these benchmarks running in tandem, the CPU speed fluctuates, dropping to 800 MHz, then up to 2.2 GHz and then all the way up to 2.4 GHz. When just running the Cinebench R10 OpenGL Shading Test, the power consumption peaked at 61.4 watts for a brief period of time. 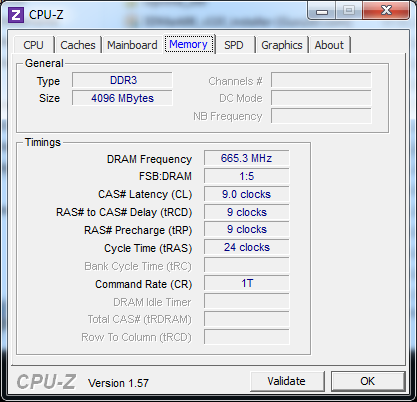 The downsampling of the CPU clock can, therefore, possibly be associated with a level of power consumption too high for the power adapter to handle, the consequence being reduced performance. In Mac OS X, we did not observe such behavior, the energy consumption staying a good deal below the levels measured in Windows 7. The hard drive in our test model is a conventional HDD from Hitachi. 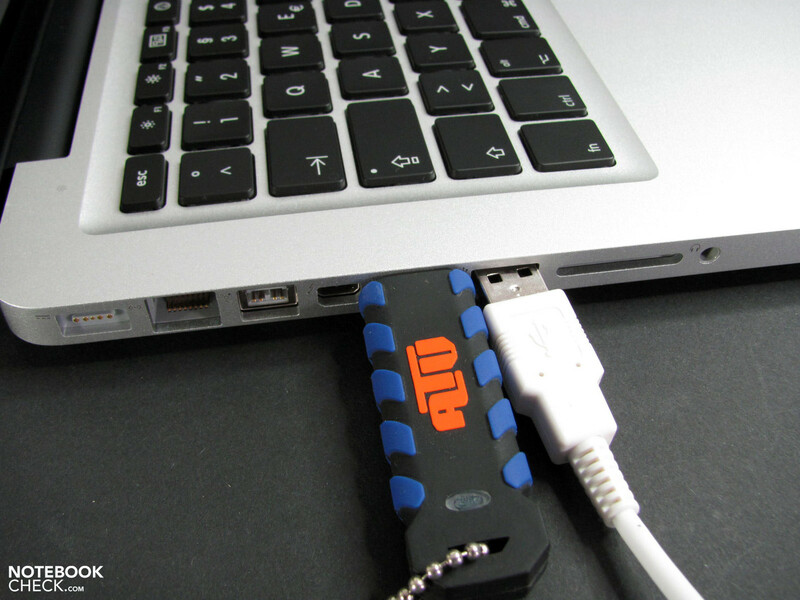 It has a rotational speed of 5400 RPM and a storage capacity of 320 GB. 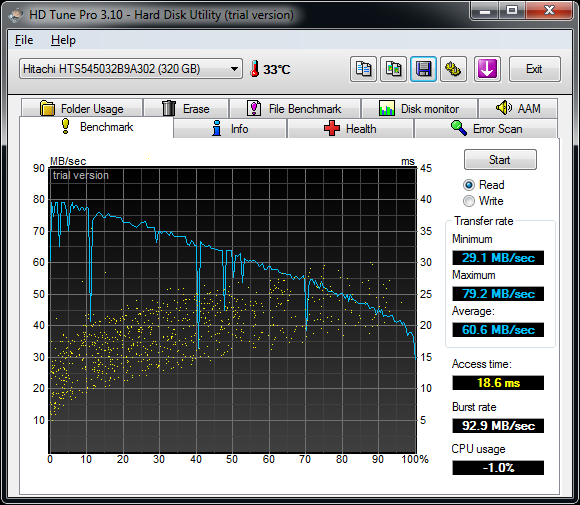 One of the great benefits of this particular HDD is how quietly it works. It only becomes audible when you place your ear very close to the case. In terms of its data transfer speed, it can be called average at best with a maximum of 80 MB/s and an average transfer rate of 60 MB/s. Choosing a newfangled solid state drive (SSD) instead can greatly increase transfer speeds, but they tend to be a good deal more expensive and have much less storage space than traditional HDDs. In terms of gaming potential, the MacBook Pro 13 with the Intel HD graphics card doesn't bring much to the table. Only running undemanding titles at low resolutions with low detail settings results in a smooth, playable frame rate. In this case, the Nvidia 320M truly would perform better but still doesn't have what it takes to render resource-demanding 3D games. 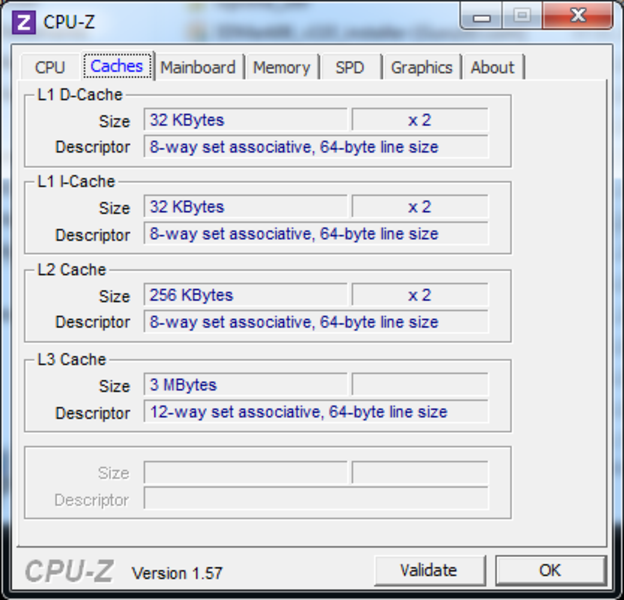 The following gaming tests were performed in Windows 7 (via Bootcamp). Under light use, the system remains very quiet. With the hard drive normally humming at 30.3 dB(A) and 30.6 dB(A) when retrieving data, the overall noise level is very low. This remains the situation for good while and only rises to 44 dB(A) with moderate and heavy use. 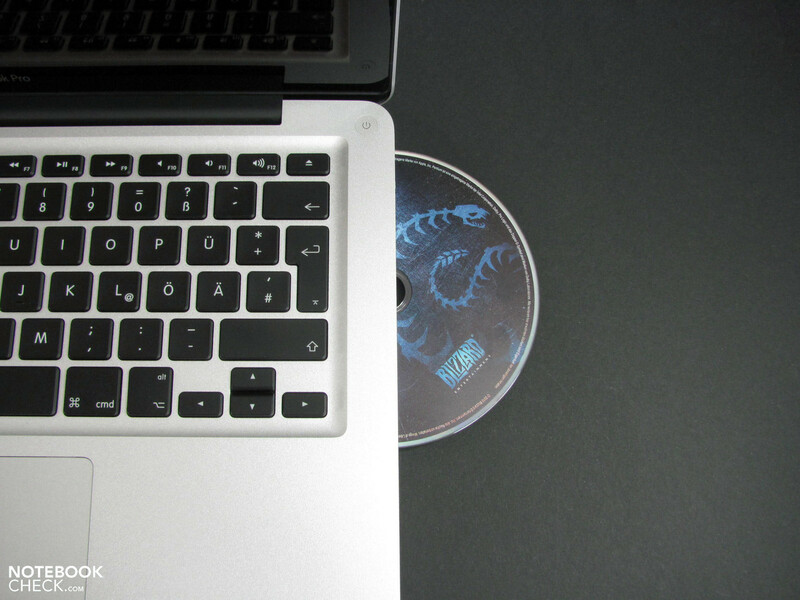 Differences in system noise between Windows and Mac OS X are mainly attributable to the DVD drive, which hums in Mac OS X at a lower 31.4 dB(A) than the 33,1 dB(A) measured in Windows. 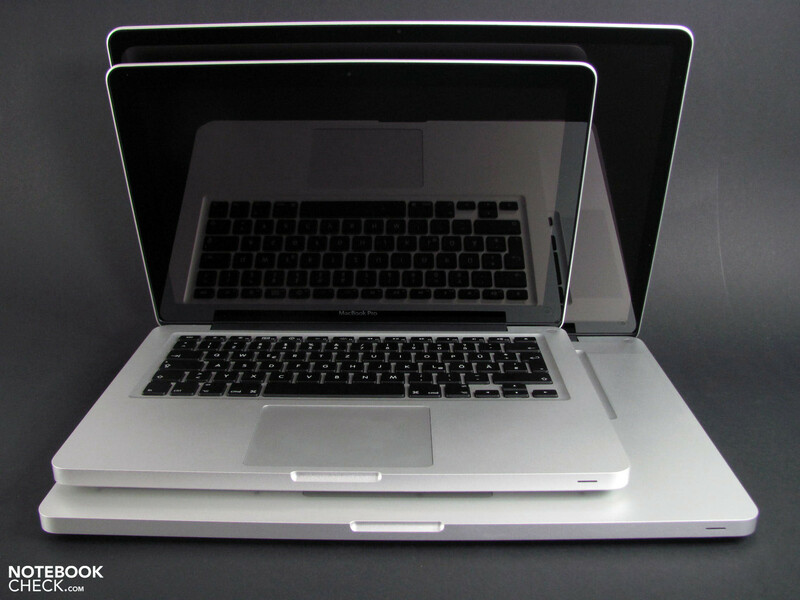 The case surfaces reach a maximum of 44.9°C during the stress test (Windows) and 38.4°C (Mac OS), staying below critical levels even in the worst case scenario. During prolonged light use, the temperature remains about 10°C lower. Inside the case, the CPU heats up to 92°C after an hour of Prime95 and Furmark running simultaneously. 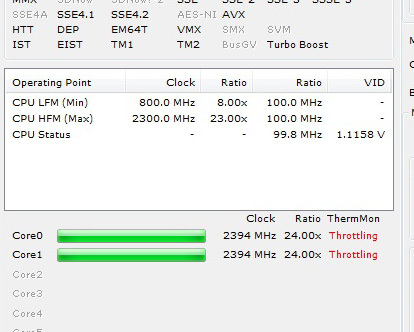 During this stress test, we did not observe any CPU throttling, the clock remaining at a fairly constant 2.3 GHz with little fluctuation. (+) The maximum temperature on the upper side is 39.6 °C / 103 F, compared to the average of 35.8 °C / 96 F, ranging from 22 to 57 °C for the class Subnotebook. 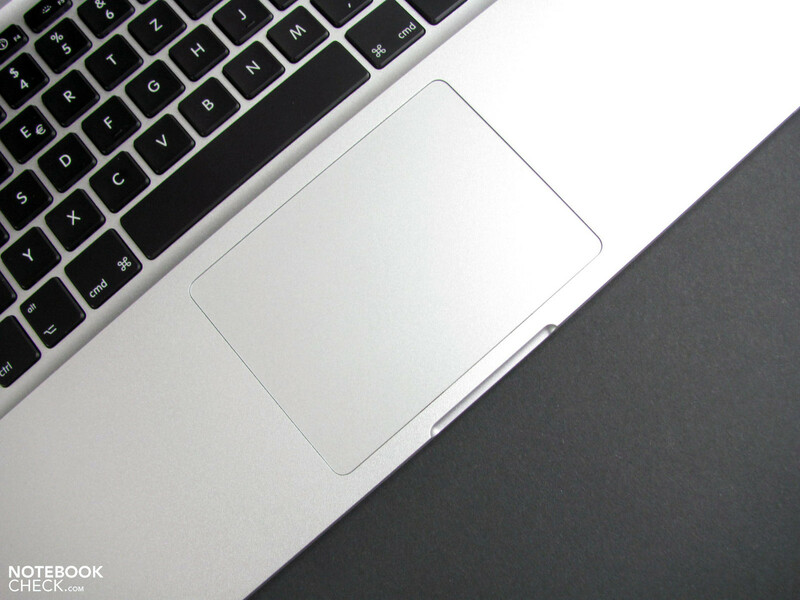 (-) The average temperature of the palmrest area of similar devices was 28.6 °C / 83.5 F (-2.5 °C / -4.5 F). 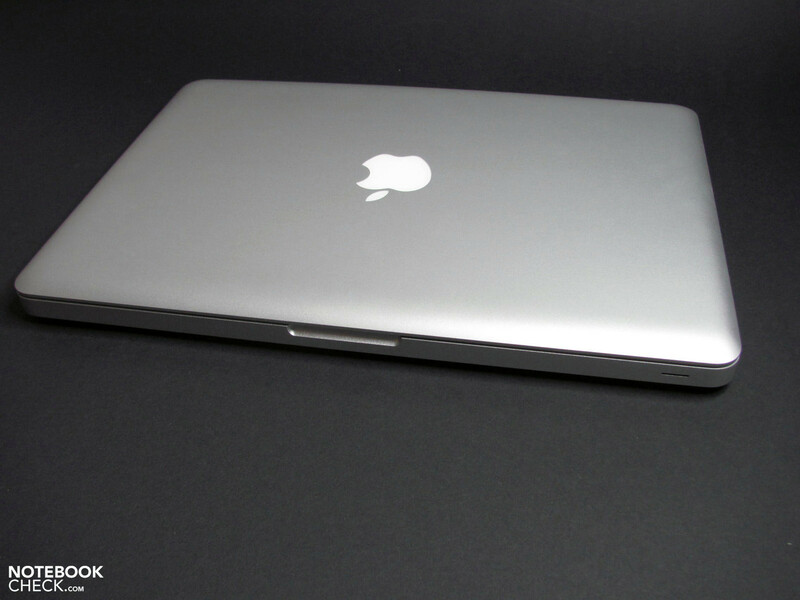 The speakers of the MBP 13 are pretty good for some background music or the occasional film. As is typical in many notebooks, the mids and bass are lacking, the highs emphasized instead. The maximum volume is not very high but should suffice for everyday activities. 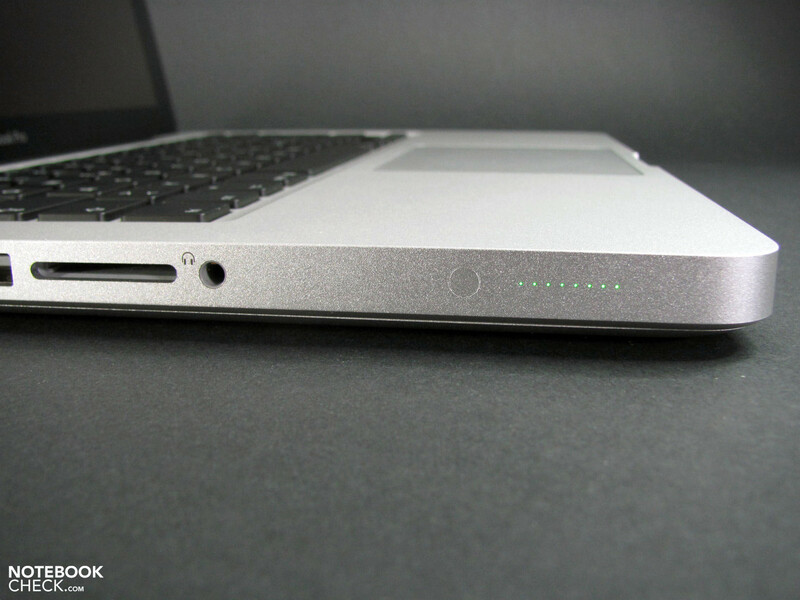 The MacBook Pro is equipped with a non-removable (at the risk of voiding the warranty) 63.5 Wh battery that profits from the low power consumption in Mac OS X. This ranges from 6.6 to 56.4 watts depending on intensity of use. 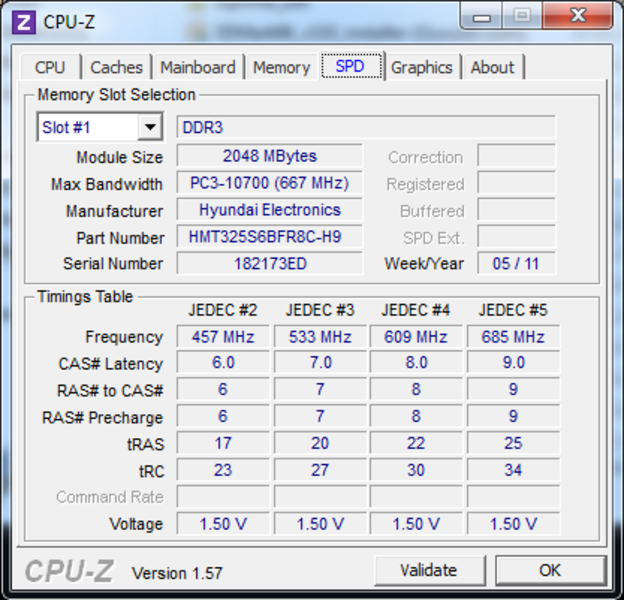 Those using Windows 7 via Bootcamp should expect considerably higher power consumption even under light use. Here the minimum is 16.1 watts, rising as high as 61.4 watts during the Cinebench R10 OpenGL Shading Test. This elevated level of power consumption is particularly disadvantageous when it comes to everyday activities like browising the internet via wifi, doing office work, watching films, and so forth. 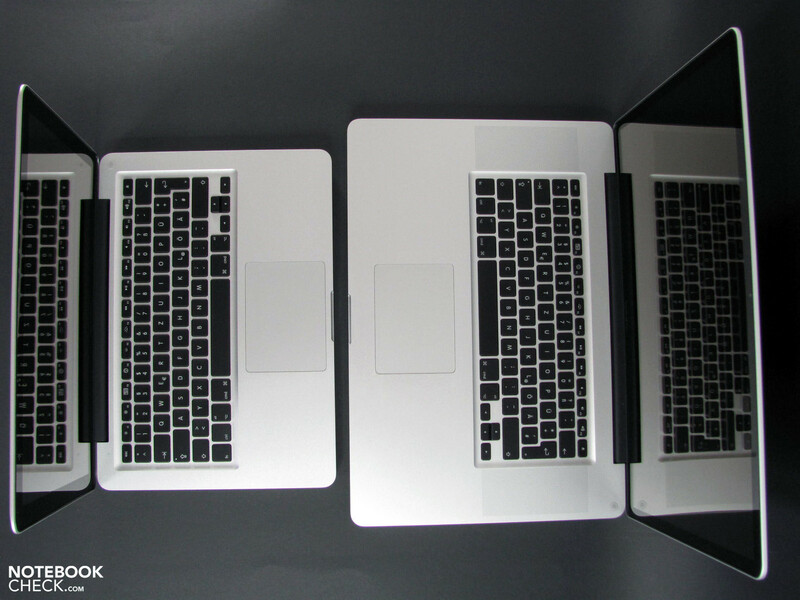 In Mac OS X the power consumption level stays—on average—about 10 watts lower than in Windows. 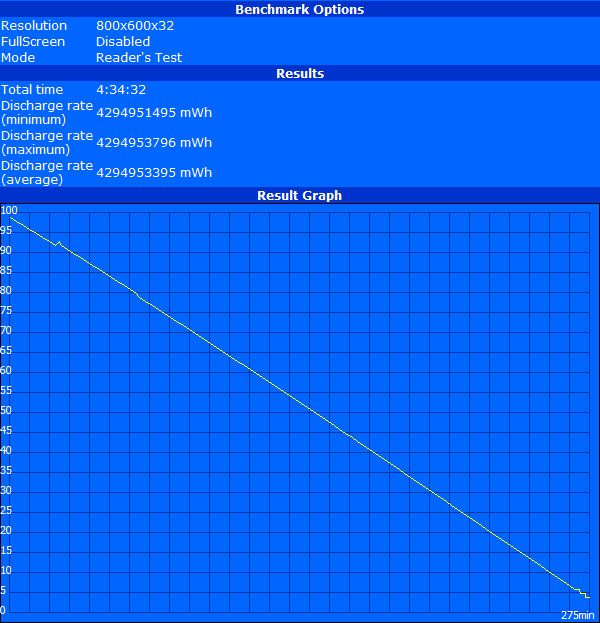 The battery life measured under various conditions likewise tends to vary between the two operating systems. 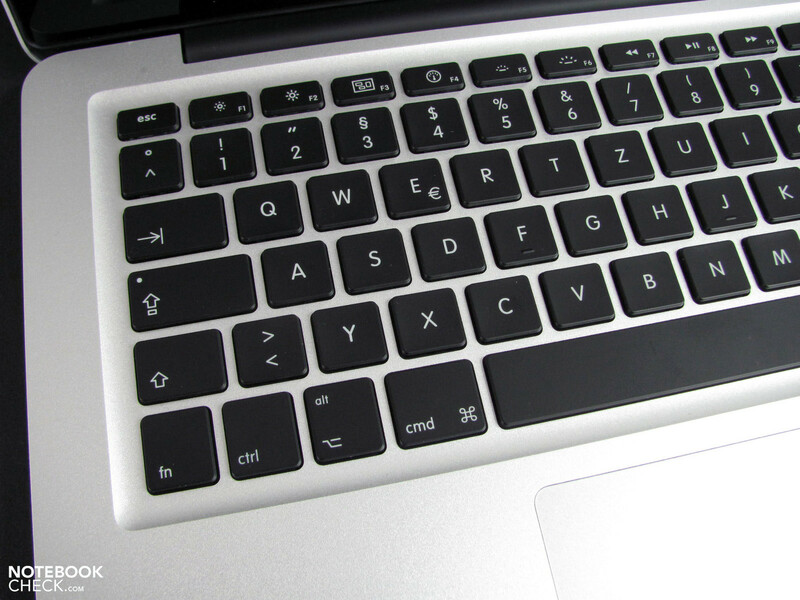 In Windows, the laptop can keep huffing and puffing away on battery power anywhere from 77 minutes to 275 minutes, considerably less time than is possible in Mac OS X: 84 minutes to 619 minutes. Still, the longest battery life measured under each operating system is not very realistic because the screen brightness has to be at the lowest setting and the wifi/bluetooth turned off in order to achieve such a long battery life. With realistic conditions like when browsing the internet via wifi with decent screen brightness, we measured a battery life of over 6 hours in Mac OS X, a more than decent battery life. Windows falls short in this test, managing a mere 2.5 hours. In the battery life test under heavy use, the disparity between the two operating systems nearly disappears—since the hardware is being pushed to the max. The model we're reviewing here trumps the more powerful version of the MBP13 with an 11-16% longer battery life in all test scenarios (note: wifi test results not comparable). 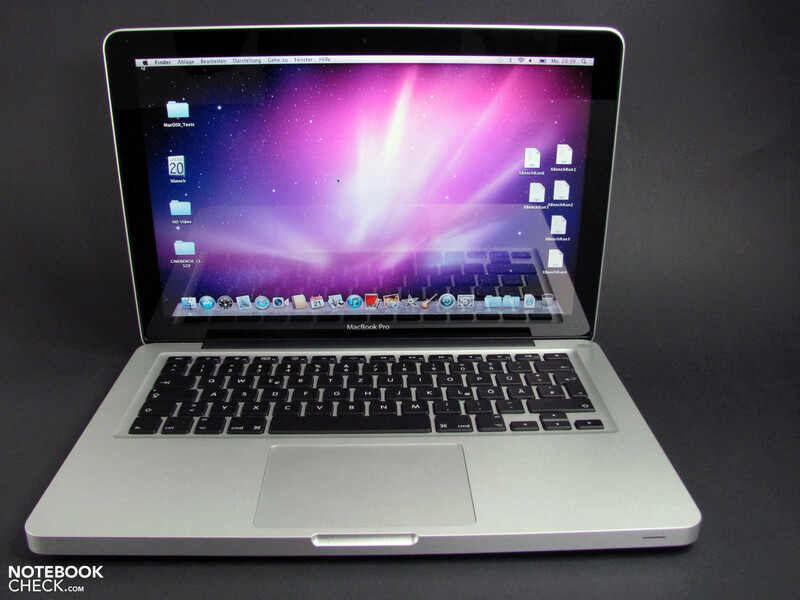 The high-quality case and price have not changed. While the quality of the case serves as an example, the high price to pay for this premium quality should come as no surprise. 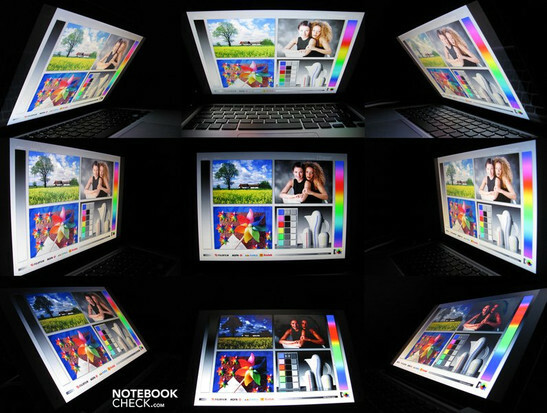 Among other highlights are the comfortable and conviently backlit keyboard as well as the high-quality screen, which does however reflect bright surroundings and for which the choice does not exist be replaced with a matte screen. 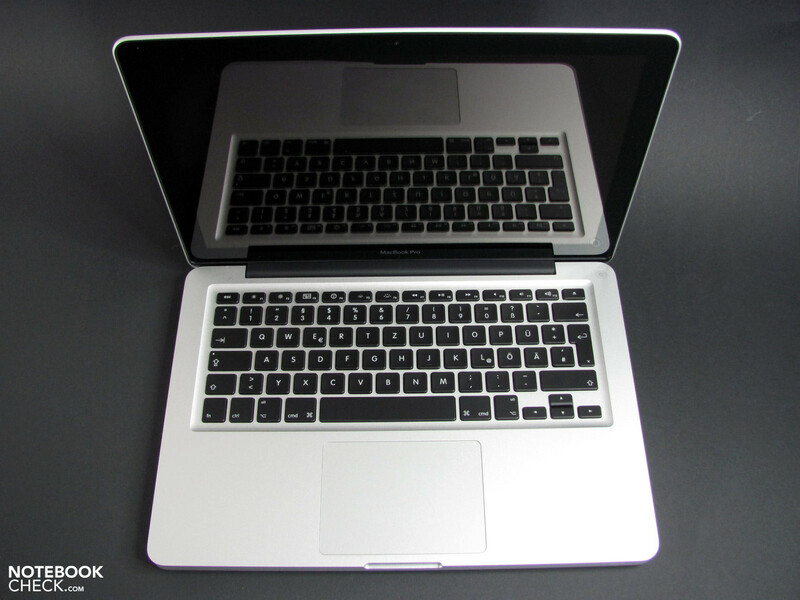 Despite its status as an entry-level laptop, the new MacBook Pro 13 impresses with its performance, coming equipped with a powerful CPU—especially when compared to the Core 2 Duo CPU of the previous generation. In return, you have to take a hit in the area of 3D graphics, which stems from the switch from the more powerful Nvidia GeForce 320M to the CPU-integrated Intel HD Graphics 3000. 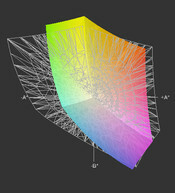 Nevertheless, most tasks can be handled just fine, only current games and 3D-intensive programs don't run too well. Some crucial differences come to light when running Windows 7 via Bootcamp. 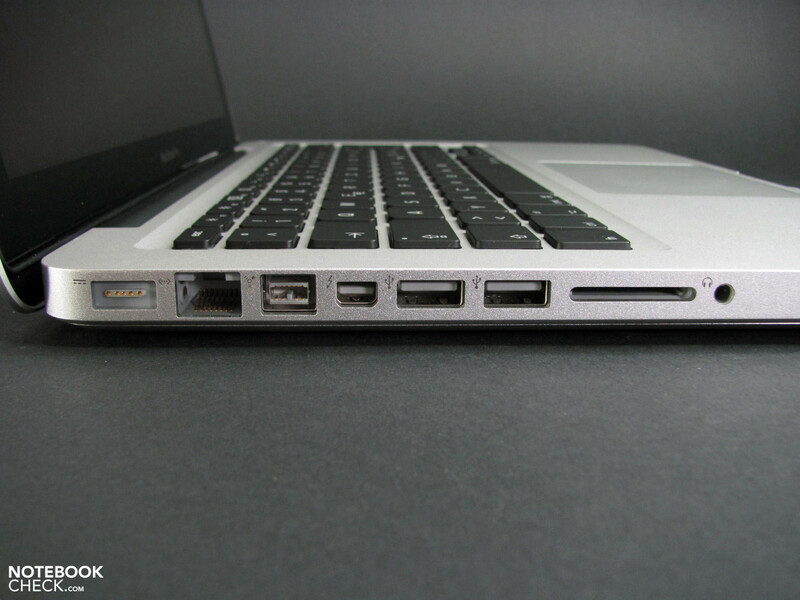 More heat is produced (although not to critical levels), the battery life is considerably shorter, the transfer rates of ports are reduced and the various benchmark scores are lower when compared performance in Mac OS X. 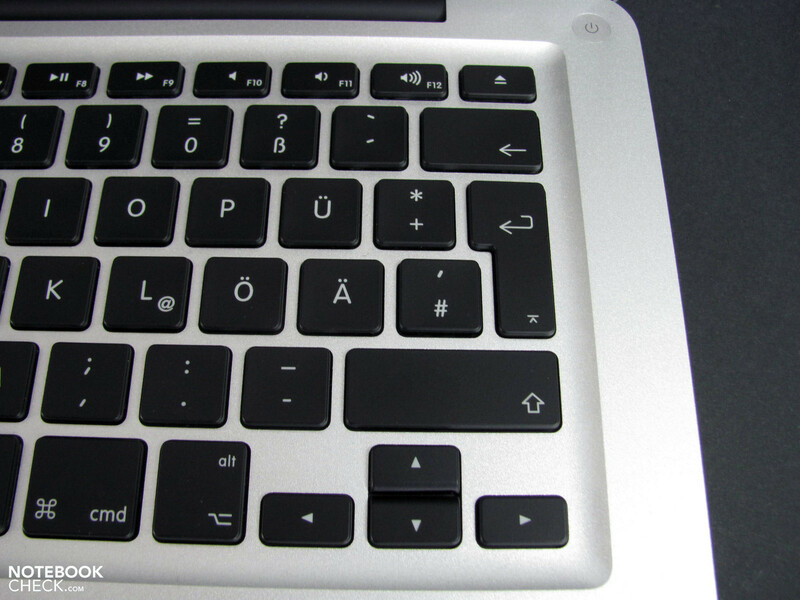 Keeping that in mind, the MBP 13 is really only good when using its own operating system.